This product costs £120 to join and then it costs £30 a week taken by direct debit. With weekly drop-ins and an initial business plan consultation process with John (our MD and owner and person typing this), you will get an individualised plan to help you get the most from this amazing resource and group. 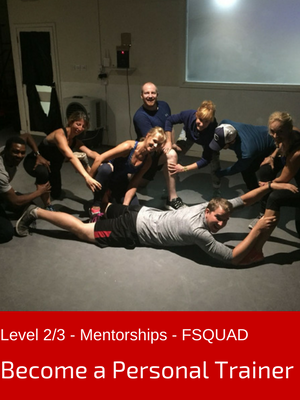 #FSQUAD is a group focussed on building you an adapting and growing business that helps you earn what you want, and enjoy the aspects of your job, while learning from a community of Fitness business people. The group has an online pre-recorded and written area to help with the skills you require to manage, build and grow your business. As the community in this group grows, then so will the collective mind that will grow our businesses and keep us on the forefront of the industry. You will also get free access to the Content Creation Club, so you can build your social media presence in a way that will take the industry by storm. Read below to see the current set of lectures that we will be running to support this and our community of trainers who are focussed to grow. This group is focussed on building and then maintaining your business. New for 2018, I have added structure and accountabilty to the group so that you can get the best from what we do. Every Monday at 10am GMT, you will need to jump online. We alternate weeks between #FSQUAD content and Creative Content Club content, in an effort to make sure you have the most successful business possible. All these run from 10am GMT to 11am GMT – 45-minute lecture and 15-minute task. Although we will focus on one are of delivery, also we will be planning to release videos, blogs, podcasts and supporting these with likes, shares etc. Additionally, the Content Club will have a growing library of online content that is pre-recorded and built to help our group go through the technical steps to building video, blogs and podcasts. To stay in this club people will be required to participate.